Trump Attorney Michael Cohen's Secret 3rd Client: Fox News Host Sean Hannity A federal judge ordered an attorney for Cohen to reveal the identity of a client that had been withheld as part of a battle over evidence following an FBI raid of Cohen's home and office. 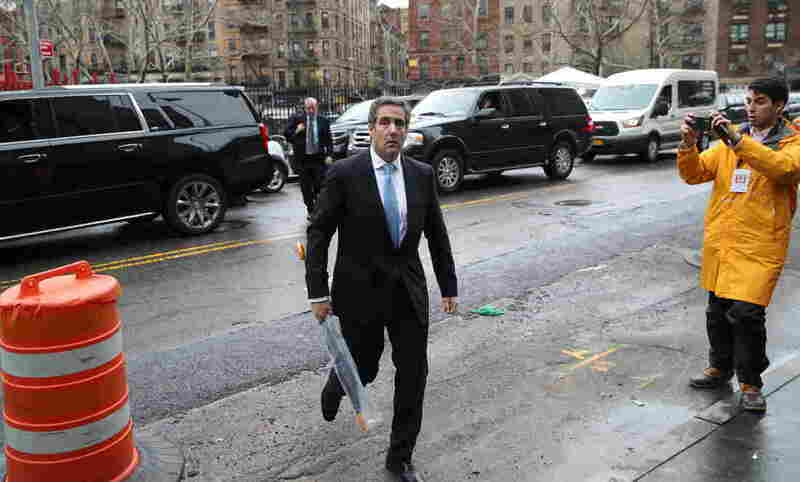 Michael Cohen, President Trump's personal attorney, arrives at federal court on Monday in New York. Donald Trump's longtime attorney Michael Cohen also has been representing Fox News host Sean Hannity, it emerged in federal court on Monday. Federal judge Kimba Wood ordered an attorney for Cohen to reveal the identity of a client that Cohen's team had withheld in earlier court documents as part of a dispute over evidence seized by the FBI from Cohen's home and office earlier this month. Cohen and Trump wanted Wood either to permit them to review the material before prosecutors got to see it or to appoint an independent "special master." The judge said she could not decide about how seriously to treat Cohen's and Trump's claims about attorney-client privilege unless she knew what clients Cohen has been representing. So an attorney for Cohen — who had asked whether he could submit the name to the judge in a sealed envelope, or to the "special master" — had no choice but to reveal it in open court. Does FBI Raid On Trump Lawyer Cohen Mean Attorney-Client Privilege Is 'Dead'? Cohen's attorney had previously identified two other clients: Trump and Republican fundraiser Elliott Broidy. Those men are involved in cases in which Cohen allegedly arranged payments to women to keep them quiet about alleged sexual encounters. Cohen has acknowledged paying pornographic actress Stormy Daniels $130,000 shortly before the 2016 election for what her lawyer said was silence about her alleged liaison with Trump in 2006. Cohen also reportedly arranged a deal for Broidy in which model Shera Bechard was paid $1.6 million when she became pregnant after an affair. Trump denies any sexual relationship with Daniels. Broidy acknowledged the affair with Bechard and apologized to his family. There was no indication as to whether Hannity might have been involved in such an arrangement. He issued a statement on Monday afternoon that said his discussions with Cohen had never involved anyone else. "Michael Cohen has never represented me in any matter," Hannity said. "I never retained him, received an invoice, or paid legal fees. I have occasionally had brief discussions with him about legal questions about which I wanted his input and perspective. I assumed those conversations were confidential, but to be absolutely clear they never involved any matter between me and a third party." Hannity said separately on Twitter that his discussions with Cohen "dealt almost exclusively about real estate." Hannity has been a champion of Trump's and Cohen's on his show and a critic of the FBI and Justice Department; former House Speaker Newt Gingrich said on Hannity's show last week that the FBI raid on Cohen was like the abuses of the "Gestapo." After a long hearing on Monday, Wood said she had concluded the hearing without deciding whether to appoint the "special master" sought by Cohen or to permit the Justice Department's "filter team" to continue its work. While federal investigators will retain possession of what was seized, they still cannot look at the substance yet even as they are cataloging the amount of papers, electronic files and other materials.